Winnipeg-based Indigenous artist Troy Fontaine creates elaborate costumes from garbage, recycled and reclaimed materials he finds in dumpsters. He performs in costume on Winnipeg streets. Winnipeg-based Indigenous artist Troy Fontaine creates elaborate costumes from garbage, recycled and reclaimed materials he finds in dumpsters. He also performs in costume on Winnipeg streets. His niece, filmmaker Sherry Larocque, sat down with her uncle to talk about his unique art. Fontaine is an Indigenous artist born and raised in Winnipeg, Manitoba. The youngest son of eight children, he has made a living from a variety of art forms. Fontaine has created large scale oil paintings, graffiti art, murals, and costumes for performance. He prides himself in the ability to create art with limited budgets and using items most people would consider trash. 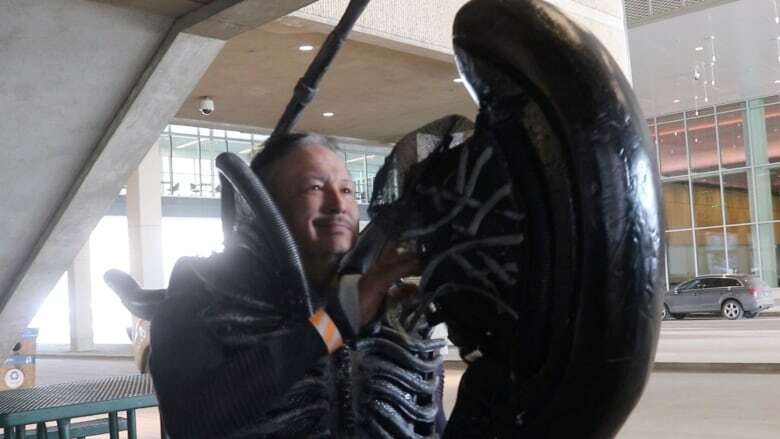 He's also known as 'that Alien guy' in Winnipeg and can sometimes be spotted in costume performing on city streets. 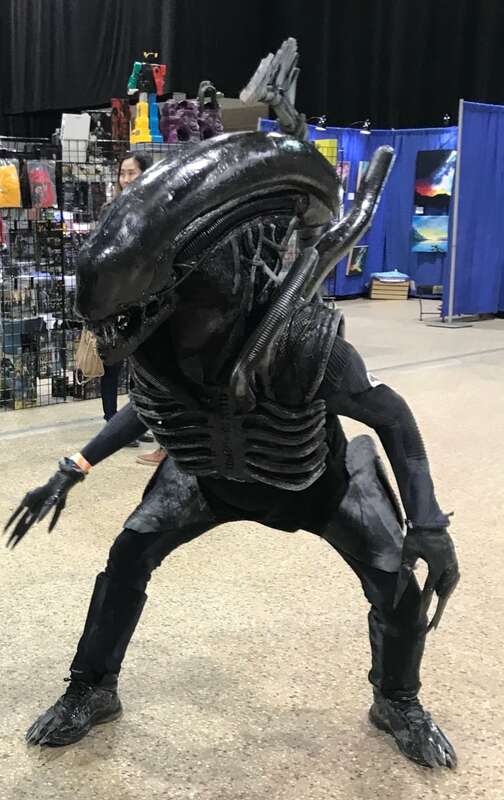 Fontaine has made elaborate Beetlejuice, an Alien movie xenomorph, and Predator costumes, all from garbage, cast-offs and materials he has found or repurposed. Larocque is an Indigenous content creator and an aspiring filmmaker. She has dabbled in the industry as a director, writer, and editor. She has recently decided to pursue her passion for filmmaking. Sherry: What do you consider art? Troy: Anything is art. Music, painting, movies, dancing, comedy. It's all art. If you can dream it and make it, it's art. Sherry: Do you have a process for each piece of art you make? Troy: I dream it, sketch it and search for materials. Sometimes it can take months, and sometimes I find what I need right away. I always have a few projects on the go. Troy: Why not? It's free and available. You just have to forget what people think and just do it. Empty containers, foam, cardboard it's all in the bin for free with all the details you need. Sherry: Are you the only artist in your family? Troy: We're all artists in our own ways. My brothers do different types of art but we all paint and draw, just different styles. My sisters are crafty and more creative in the kitchen. My nieces and nephews are more into computers and camera stuff. But art is different for everyone. Sherry: What other types of art do you do? Troy: I do window and building murals, costumes, canvas paintings, pencil sketches, and graffiti art. I was one of the biggest graffiti artists back in the day, but it wasn't considered art then. I can sketch someone in under 10 minutes with just a paper and pencil. I have a client who I am doing a series of paintings for. He's a dentist and he loves my work. I'm making him a large painting for his office. Sherry: What's the best part about entertaining people on the streets? Troy: Seeing people have fun. They laugh and always want photos. You can't just dress up, you have to put on a show. I wear the alien costume. It's exhausting but so fun and I'm glad that people enjoy it. I've been an artist my entire life. My survival has been because of art both physically and mentally. I've never been a starving artist. Sherry: Why do you do it? Troy: Why not? It's fun and entertaining. It's easy to make someone's day. If they're having a rough day and just need a laugh, I did my job. Plus, I can make a couple bucks here and there. Sherry: Do you make money from your art? Troy: When I draw sketches of people on the street, I usually charge five dollars. When I dress up and entertain in costume, sometimes I'll let people know that this is what I do as an artist and because they enjoy it and appreciate it, they will offer me money. I also do custom art, like the painting I'm doing for a dentist I know. I do Christmas window paintings every year too with Santas and reindeers. You name it, I'll paint it on a window. I love doing these because people are always in the spirit of Christmas afterwards. Sherry: What's your favourite piece of art you have made? Troy: I love them all. Because they happened in different parts of my life for many different reasons. I'm very versatile, like in my artistic skills. Sherry: What are some challenges you've had? Troy: I don't like to dwell on the past but I've had it rough. Art has always been there, to help me express those tough times. It's good to get it out so it doesn't stay with you. If you're down, pick up a paint brush or pencil and get it out. I just want to move forward and persevere. Sherry: What are your hopes for the future? Troy: My hopes are to continue to make costumes and having people enjoy them. I'm not getting any younger, it gets difficult to dress up and move around sometimes. I'd also like to see more young people getting out there and entertaining. Sherry: What do you want to make next? Troy: I want to make a movie. I want to build costumes and characters for a movie I'm writing. I'm writing a script. It's a short film for the youth. I'd also really want to do a 3D anamorphic pavement drawing. (A 3D sidewalk mural or drawing using chalk or paints.) I've done one on my floor in Vancouver before but not on pavement. That would be so fun. People would love it. Sherry: Do you have any advice for the youth? Troy: Make art, create anything and don't let anyone tell you that you can't. You don't need the fancy stuff, use what you have and use your imagination, that's all you need and you can make anything. I grew up poor. My mom had eight kids. We would draw cartoons and comics because we couldn't buy them. You just have to do it.